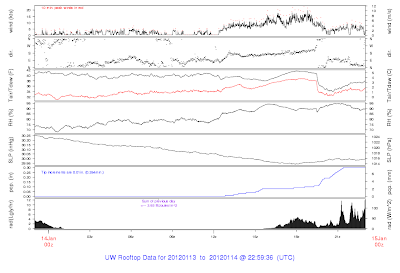 It was an exciting morning...with some wet snow hitting a number of places as the front moved through and the convergence zone formed in its wake. In fact, it is snowing NOW in the CZ near Everett! As the precipitation ended near Seattle and elsewher, the temperatures have warmed up and now (according to Snowwatch) the freezing level is around 1500 ft outside of precipitation (see below). Remember, that implies a SNOW LEVEL of around 500 ft. 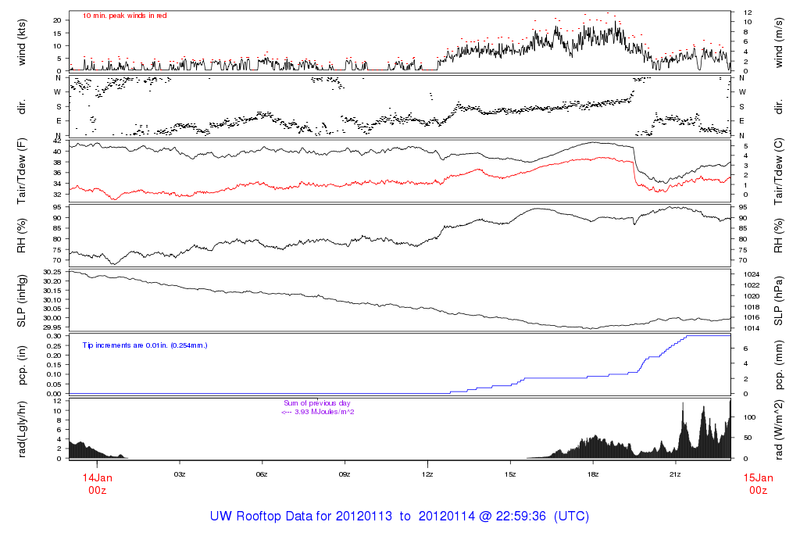 The greatest convergence zone precip around noon was north of Seattle. Look at these surface temps at that time--WAY cooler north of the city where the precip was heavier. Here is the latest radar image...you can see the convergence zone precip (including snow) over the north Sound and the showers coming in off the ocean (thanks to the new radar!). Snow showers in the mountains. These showers will continue to move in, and the convergence zone should bring snow to the north Sound for several more hours. 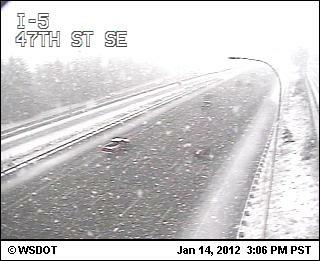 Here is a traffic cam near Everett...really snowing there now. A bigger general snow threat is tomorrow when an upper trough moves in and revs ups the precipitation, with an associated low center moving into the region. It will be much colder then and a few inches of snow could result over Seattle and NW Washington. Then another disturbance moves in late Monday (more snow!) and then on early Wednesday we could a lot of wet snow as a warmer disturbance moves in, eventually leading to rain. But more on that later.